Rollie Fingers may be a Cy Young Award winner, the AL Most Valuable Player of 1981, and a Hall of Famer with a career ERA of 2.90, but the first thing people think about him relates to his epic mustache. He stills wears it with pride and gets asked occasionally to rank the facial hair of MLB players on the field. But there’s only one Rollie Fingers handlebar special, and no one has yet to come top the ‘stache that defines an era of baseball in Oakland — if not America as a whole. 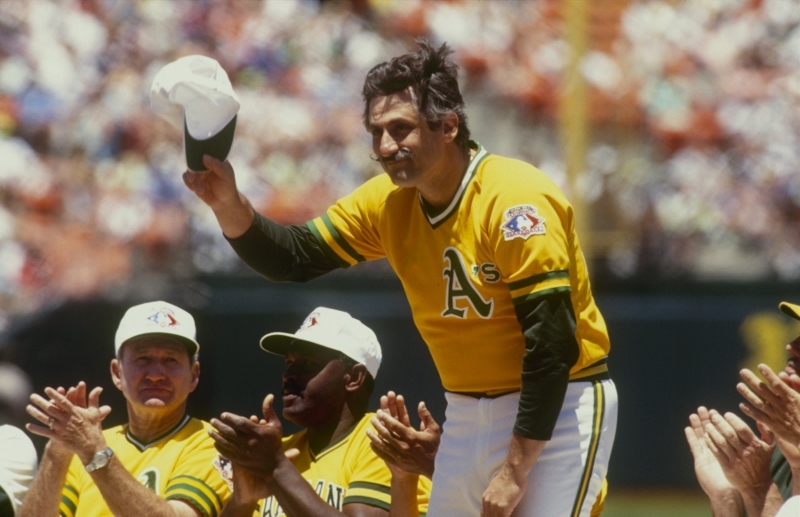 On this stop of our tour through MLB history, we check in on the birth of the Rollie Fingers mustache and, like so many other great things, find the saga began with a $300 prize. We don’t use the word crazy lightly, but we feel it is necessary to open such a discussion about former A’s owner Charles O. Finley. In the sideshow tradition of Bill Veeck, the man who once sent a midget to hit in a St. Louis Browns game, Finley would try anything to get bodies into the seats. When he bought the A’s, the franchise was then in Kansas City, and Finley pulled out all the stops. To name just a few quoted in SABR, the A’s owner had cow-milking contests; hired Miss U.S.A. to be the batgirl; inserted a mechanical rabbit behind home plate to pop up and give the umpire baseballs; had a yellow cab bring in pitchers from the bullpen; and installed a zoo beyond the stands in left field. Just another day at the ballpark. He also obsessively meddled in player transactions, signings, and everything relating to the strategy and execution of the game, which (to fans and players alike) seemed like an afterthought. Nonetheless, by the time Finley and the team moved to Oakland in the late 1960s, the man who made George Steinbrenner seem like a behind-the-scenes owner had built up a winning team from a perennial loser. But he was far from finished with his antics, and in 1972 decided his club needed mustaches. 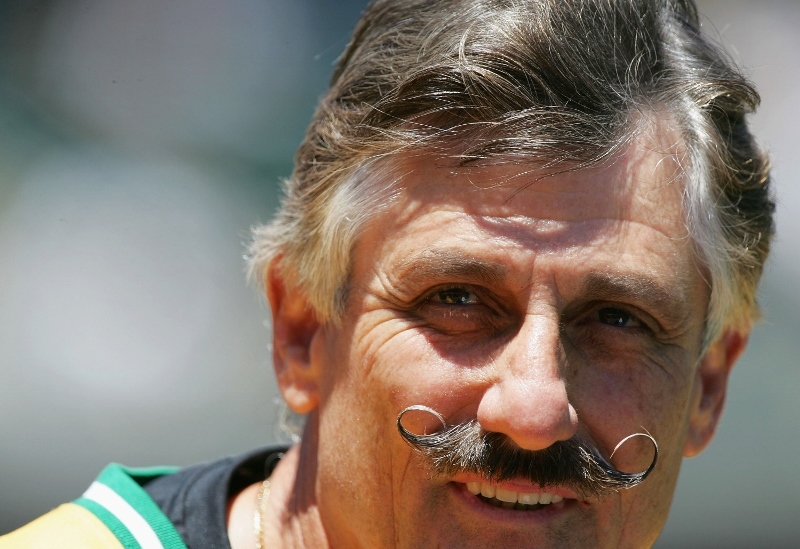 Rollie Fingers obliged. After Reggie Jackson showed up at Spring Training in 1972, Finley was tempted to force him to shave it, but instead he came up with a gimmick that better suited his tastes. He created “Mustache Night” at the ballpark in Oakland and allowed fans to come in at a discounted rate if they had ‘staches in place. Most importantly, he offered players $300 to join in on the fun. Only Fingers went big with his handlebar masterpiece. His A’s teammates wanted the $300 too, so they soon became known as The Mustache Gang. But no one ever topped the piece of work that has decorated the area below Fingers’s nose for the past 40-odd years. Of all the wild things Charles Finley did — and he is responsible for several sideshow elements of modern baseball games — none have brought so many instant smiles as the Fingers handlebar. For that, we have to salute one crackpot owner’s antics. On top of rocking his ‘stache, Rollie Fingers recorded 114 wins and 341 saves across his 17-year career. He entered the MLB Hall of Fame in 1992.